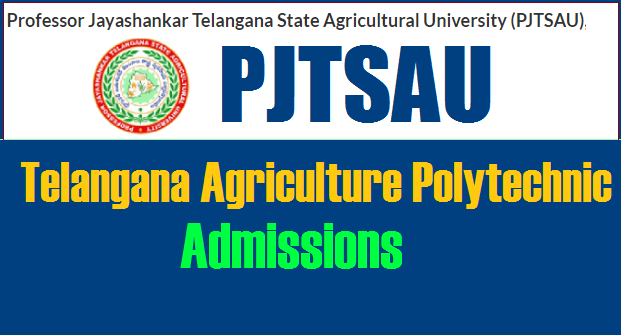 www.pjtsau.ac.in PJTSAU Telangana Agriculture Polytechnic Admissions Notification 2018- Apply Online: Telangana TS PJTSAU Agriculture Polytechnic Admission 2018 Notification. Telangana Agriculture University Agricultural Polytechnic Admission 2018 Notification. Professor Jayashankar Telangana State Agricultural University Polytechnic diploma courses Admissions 2018, PJTSAU Polytechnic Admissions 2018, Professor Jayashankar Telangana State Agricultural University Polytechnic Admission Notification 2018, two (2) year Polytechnic Diploma Courses and three(3) year Diploma in Agricultural Engineering Course. Agricultural Polytechnic, Seed Technology, Agricultural Engineering Polytechnic courses, TS Agriculture Polytechnic Admissions entrance test 2018, Telangana Agricultural University, Application form, last date for apply online, exam date, results, hall tickets,eligibility,fee detail are given here. Professor Jayashankar Telangana State Agricultural University has published theAgricultural Polytechnic Admission 2018 Notification on 30-05-2018 admission into two year duration Agricultural, Seed Technology Polytechnic Diploma Courses and Three year Diploma in agriculture Engineering courses in Professor Jayashankar Telangana State Agricultural University (PJTSAU) and its affiliated recognized private Agriculture Polytechnic institutes for the academic year 2018-2019 . The students who have passed SSC or equivalent exam and those who are residing in rural areas are eligible. The student must have studied at least 4 years during the period of first to tenth class schools located in rural areas. The candidates should obtain 55 percent marks (excluding Hindi) or 5.0 Grade Point Average. In case SCs and STs , PH categories the candidates should obtain at least 45 percent of marks or 4.0 Grade Point Average. Medium of instructions for all the Polytechnic course is Telugu. The candidates for admission to first year polytechnic courses in the University shall be required to have completed 15 years of age as on 31st December, 2018 of the year of admission with an upper age limit of 22 years. Selection process through on the basis of SSC Grade Point Average value. Admission will be made on the basis of performance in their qualification. 1. Only ONLINE application will be accepted. No application will be accepted in any other format and will be summarily rejected. So, candidates can apply through online mode only. 3. The candidate has to visit the website : www.pjtsau.ac.in and fill the OTR (one time registration) application. 4. The applicant should carefully read the prospectus before proceeding to apply online. He / She can either download a copy of the prospectus Click here to download or read it online. evidence of the Date of Birth. • Bonafide / Study Certificate from 4th to 10th Class. • National Cadet Corps (NCC) Certificate. • Sports and Games Certificates. • Children of Armed Personnel Certificate / Defence Personnel Certificate. • Non-Municipal Area Study Certificate (Form-I). The University may take up ONLINE allotment of seats. Hence, the applicants may be called for the purpose of verification of certificates and they will be required to fillup an option form. The necessary details will be placed on the University website hence, the applicants are informed to visit the University website Applicants are requested to visit the University’s website: www.pjtsau.ac.in frequently for regular updates. For any information not mentioned in the PROSPECTUS, the candidates may contact Tel. No. 040-24011854, 040-24015011 and Ext. 395 between 10:30 A.M. to 1:00 P.M. and 2:00 P.M. to 4:00 P.M. only on all working days. For more latest updates please visit the website : www.pjtsau.ac.in the E-mail : pjtsau@gmail.com. New PJTSAU Polytechnic Admissions 2018 Counselling Dates will be provided soon here.